Focus on FesiaWalk pilot in Portugal. FesiaWalk is an electro stimulator device dedicated to people suffering from neurological problems because of a disease or an accident. It is used in rehabilitation centre for people suffering from “falling foot”. It delivers electrical impulses to the nerves of the shin and fibular to induce a dorsal or plantar flexion of the ankle in the corresponding phases of walking. This is a tool coupled with parameterization software which allows to record the patient profile. 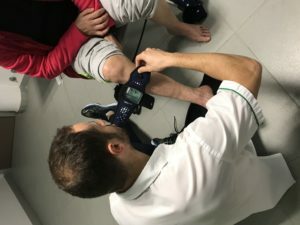 In Portugal, the pilot ran in the rehabilitation center of the Santa Casa da Misericórdia de Barcelos in December with a rehabilitation team composed by a doctor and two physiotherapists, and two patients. 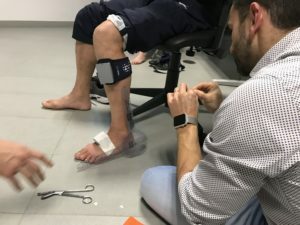 There was a first training session for the professionals, a week before the living sessions with the patients. The test included the calibration of the equipment for each patient, and the walk experience. 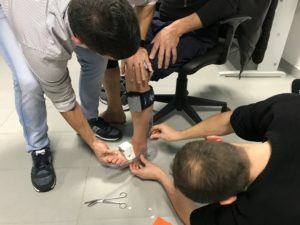 The experiment was designed to allow the best observation of the effects and impact of the equipment on the falling foot while walking, through the video recording. 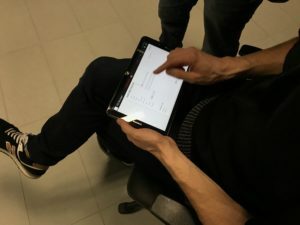 The data of the experiment was captured from the testimony of patients and physiotherapists, as well as the video used later for image processing. This pilot provided a set of comments and recommendations from the professionals to the equipment builder, which are being compiled into a report.